This page gives complete directions on how to backup all the user data, patches, patterns recorded in your Handsonic HPD-15. This process will save (copy) all the Handsonic data to a file on your Windows PC. You will be able to restore the data from files on your PC to your Handsonic as well. If you have a joystick port (15 pin connector on the back of your PC), you need an adapter cable to connect the PC joystick port to the Handsonic via MIDI. If you do not have a MIDI interface, I recommend the M-Audio Uno (less than $50). It plugs into a USB port and includes MIDI cables. I use this with my laptop. Plug both plugs from your MIDI cable into your Handsonic. With the Uno interface, you plug the round DIN plug marked IN into the MIDI IN jack on the Handsonic and the DIN plug marked OUT into the MIDI OUT//THRU jack on the Handsonic. This is backwards from what I expected, so you may have to experiment with cabling on your interface. Next, You will need to download a free program called MIDI-OX from http://www.midiox.com/ This Windows program can communicate with your Handsonic via MIDI. Run midioxse.exe and it will install itself. Information on saving data is in the Handsonic manual on pages 80-81. I will explain all that here. The process of saving user data (patches, patterns, system settings) from the Handsonic is called a "Bulk Dump". This means to transmit a copy of the data defining all the settings out the MIDI OUT port on the Handsonic. The dumped data still remains stored on the Handsonic. The data is encoded in a MIDI data format called System Exclusive (SysEx). See page 100 and page 108 of the Handsonic manual for the technical details. Your PC will be the "External Sequencer in this diagram. We will capture the Bulk Dump data from the Handsonic using the MIDI-OX program on the PC. We will save this data in a disk file on the PC. 1. Connect your Handsonic MIDI OUT to your PC MIDI interface. (You may also connect MIDI IN to the PC at this time -- it will not cause any problems). Power on the Handsonic. 2. Start the MIDI-OX program on your PC. You will need to configure it for your MIDI interface. Choose MIDI Devices... on the Options Menu. 3. Select the MIDI Input and MIDI Output for the MIDI interface you have connected to your Handsonic by clicking on the correct items in the lists on the left. (You may have multiple MIDI interfaces on their PC including "virtual" interfaces that allow you to play MIDI music through your PC speakers - e.g. Microsoft GS Wavetable SW Synth). 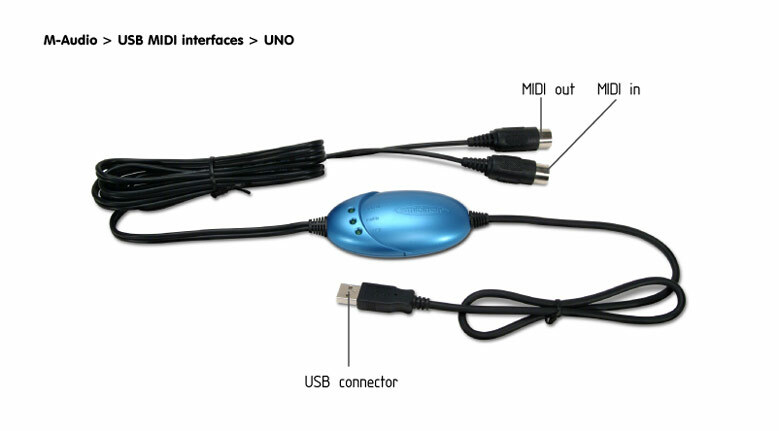 Here I have selected the Input and Output (highlighted in blue) for my Uno USB interface. 4. Bring up the Sysex window by choosing SysEx... on the View menu. 4. Choose Receive Manual Dump... from the Sysex menu on the SysEx window..
1. Press [SYSTEM] to make it light. 4. Press [WRITE] to start the Handsonic transmitting. You will see a percentage completed displayed on the Handsonic LCD display. It takes about 3 minutes to transmit all the data. Back on the PC, you will see the number of bytes received being updated during the transmission. It takes about 3 minutes to transmit all the data. 6. Back on the PC, click the Done button. 8. Enter a File name for the file to save the data in. I already have saved four "dump" files in this example. Now you have completed saving the complete data from your Handsonic onto a file on your PC. 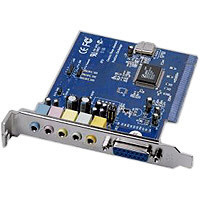 To restore data from your PC, you must connect a cable from the Handsonic MIDI IN port to your PC MIDI interface. 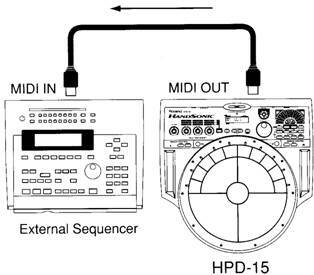 Your PC takes the place of the "External Sequencer"
You may leave both MIDI IN and MIDI OUT connected as shown below, without affecting the restore process. 1. Run MIDI-OX on your PC. 2. Bring up the Sysex window by choosing SysEx... on the View menu. A progress window will appear. When this message disappears and a normal display of the current patch appears, the restore process is complete. All data in the Handsonic has now been overwritten by the info stored in the PC file.